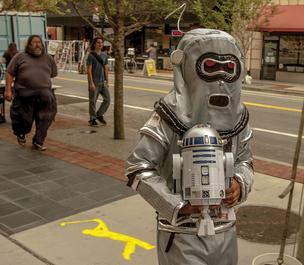 Robauto’s Chris Savage was dressed as a robot during One Spark’s first day earlier this year. The downtown festival is gearing up for its second go next year. The campaign will run Sept. 1 through Oct. 15, 2014, a news release said.One Spark has kickoffed their online crowdfunding campaign with RocketHub, it said today, looking to raise $50,000 towards the April 2014 festival’s second year operating costs. “Goods,” or rewards for donating to One Spark’s campaign, range from a shout-out on Twitter to having One Spark’s digital media manager get a tattoo of the donor’s choice on his left shin. Last year, One Spark raised $106,689 using the online crowdfunding tool, Kickstarter. One reason it switched from Kickstarter is because RocketHub’s CEO and co-founder, Brian Meece, is a former University of North Florida student. One Spark’s crowdfunding page goes live Sept. 1 at http://www.rockethub.com/projects/31032.